The HiFlo vent system is perfect for circulating air in a room or closet. Often times, when components are installed in a closet, or even in the room where they are installed, the entire room or closet requires venting to circulate the warm air. This system is easily installed and extremely effective. It is however critical that the installer uses proper judgment prior to installing the product to limit damage or complications that may occur (hitting studs, etc.). Available in 4 kits with either: 2 white grills, 2 black grills, 2 tan Grills or 1 white and 1 black grill. Note: If intending to vent a recessed plasma or other TV installation, keep in mind that this product moves a very significant amount of air, up to 70cfm, so it is not appropriate for installations where there is only several inches of clearance between the TV and the opening, or other situations where only minimal airflow is required. Use the Cool Components Recessed Plasma Vent System where space is limited. It is very important to note that when venting air you do not vent the air out of the home. Venting out of the home creates a problem in that air is being pulled from either the outside or worse the attic area to replace the vented air. 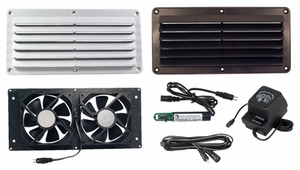 Several products on the market feature venting air out of the home which is a fundamentally flawed and will potentially disrupt the normal operation of the HVAC system.